The current Javilion release 1.2.0 allows configuration via Preferences or Project properties. Now it is very easy to change the http port or to configure automatic reloads by file extension. With the old version, you had to change the .project file manually. If you use the port parameter with Javeleon, no automatic reload is executed. The old Javilion plug-in sent a reload event after a java file was changed, but that was a bug. With the current version, you can configure, for which file extension you want to send a reload event. The configuration is saved per project. Open the project properties (right click on the project / Properties) and be sure that Javilion nature has been added to your project! Otherwise it is not possible to change the configuration. Open the preferences (Window / Preferences) and set the default values! The default values are used when you Reset the settings in your project setup. The above URL is the official SIB Visions Eclipse Updatesite. 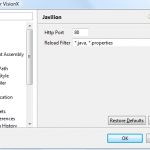 If you use Javeleon for JVx applications and your preferred IDE is Eclipse, check out our new Eclipse plugin. 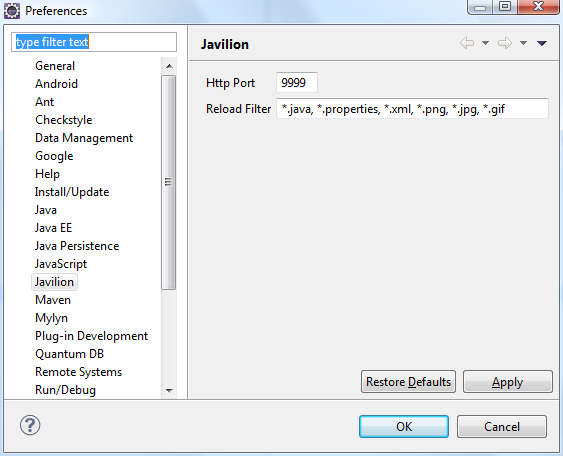 It is the inofficial Javeleon plugin for Eclipse. The name of the plugin is Javilion Plugin. It is available on SourceForge and it is released under Apache License 2.0. Simply reload Javeleon whenever you want. 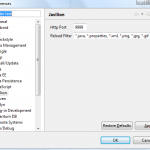 The current Javeleon version(s) does not reload when you change a resource file like .properties, .xml, ... 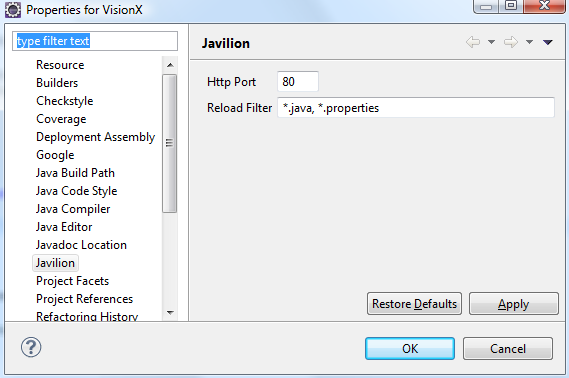 If you enable the Javilion plugin in your Eclipse project, reload happens automatically. If you want to use the plugin, use the following instructions, because we have not setup an updatesite right now! It is a little bit tricky, because we don't have a configuration UI for the plugin right now. If you use the plugin together with a Javeleon ReloadListener (-Djaveleon.reload.listener=app.MyListener), you feel the full power of Javeleon. If you are interested in alternatives to Oracle Forms, come and talk with us. We speak about "Advantages of Forms and Java combined" at the AOUG Expert meeting on 25th Mai. We show you step by step how you can create Java solutions as easy as with Oracle Forms. Or better, faster as with Oracle Forms. It is an event, organized from the Austrian Oracle User Group. There are several talks about the main topic. The talks are in German. We released VisionX 1.1.1 as little Thank you to our customers. Thanks for the great Feedback and for all the compliments! The new release contains many improvements and solves some ugly problems. It is not necessary to clear the Java or Browser cache. The application now reloads automatically. The simple export of records now creates valid CSV files. Simply open it with Excel or other Office suites. VisionX had a problem with opened database connections, because the installation waits until all resources are freed. In the current release, VisionX closes all opened connections during installation. The database installation now runs smoothly. We updated the English translation. If you reused a Tomcat setting, the port is set to 80. Now the stored port is used. Now it is possible to customize the User Management screen. If you close a form screen but not all required fields are filled, you get only one information dialog. If you sort a table with different columns and different sort orders, it is saved now. We found a potential freeze during screen update and changed the display of the data type. A value change command does not create a new insert command anymore. Have fun with this fantastic release. This beta release is an update release and contains not a lot of new features. Before 1.1, we used a semicolon ";" as separator. Now we use a locale specific separator. This solves country specific data export problems. We solved the problem with resizable modal internal frames on MacOSX. Now the resizebox is always visible. Now it is possible to set an UITable readonly independent of the IDataBook. We reverted the API change, made in JVx 1.0, because the implementation was not very clever. Now it is possible to extend the DBStorage and have full database independent support. In JVx 1.0 you had to extend the default DBStorage and the specific MySqlDBStorage and the specific PostgreSqlDBStorage.... was not very developer friendly. With JVx 1.1 you have the same features but without development overhead.